(TORONTO – November 13, 2013) It’s the pinnacle of Lexus engineering and artistry – a luxury sedan for the 21st Century, expressing bold style, advanced technology, inspiring performance and exceptional comfort. The Lexus LS series takes the flagship sedan to amazing new heights. The LS is the original Lexus. Lexus changed the luxury auto world when it introduced the LS in 1990, and the flagship sedan has earned many accolades since then. These include most appealing large premium car, according to the J.D. Power and Associates 2013 U.S. Automotive Performance Execution and Layout (APEAL) Study and the highest score among all models in the auto industry in the 2013 J.D. Power and Associates Initial Quality Study (IQS) – a position the LS has commanded for six straight years. In addition, the LS 460 earned the 2013 Residual Value Award from ALG as top vehicle in the Premium Executive Car segment. The 2014 Lexus LS is available in four models: the LS 460 RWD, the all-wheel-drive LS 460 AWD, the long-wheelbase LS 460L AWD, and the hybrid, long-wheelbase LS 600h L. Each may be enhanced with a selection of available options packages for a total of nine configurations. 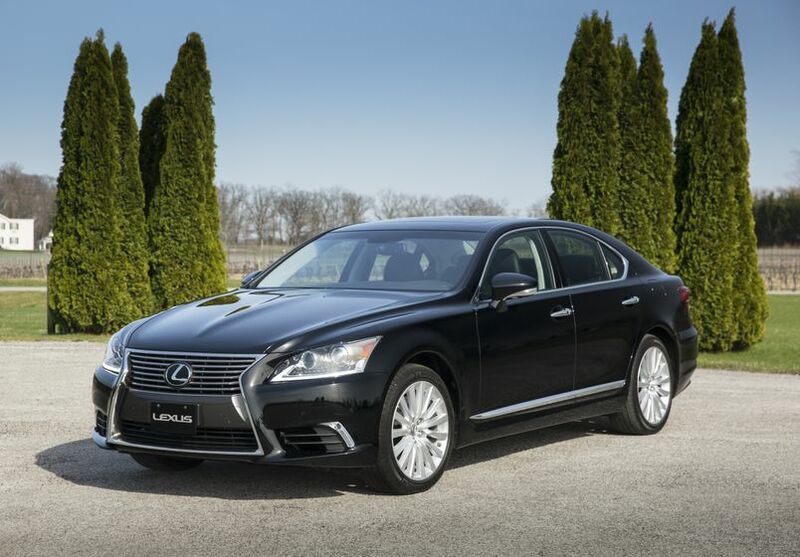 All 2014 Lexus LS models are stylish and refined. Curbside, the signature spindle grille and elegant yet boldly assertive body projects a sense of self-assured power. Exterior features on all LS series models include: 19-inch aluminum alloy wheels; dual electro-chromatic, powered and heated side-view mirrors with integrated LED signal lamps and puddle lamps; Auto-leveling Bi-xenon headlamps enhanced with the automatic headlamp system, automatic high-beam feature and headlamp washers; LED rear tail lamps and high-mount stop light, LED “arrowhead” daytime running lights and LED fog lamps; rain-sensing wipers; water-repellant front door glass; a power moon roof with sunshade; power-assist doors; easy-close trunk; power fuel-lid release; and more. Enter the 2014 LS, and enter a world of exquisite craftsmanship with room for five. Power door locks feature key lock-out protection and the driver’s seat automatically slides back and the steering wheel retracts, ushering the driver into a realm of unmatched refinement and exclusivity. Premium materials, impeccable finishes, advanced features and meticulous attention to detail combine to create an unrivaled experience for driver and passengers. Interior features include: Premium leather seat surfaces; 16-way power adjustable driver’s seat with three-setting seat memory system; 12-way power adjustable front passenger’s seat with seat memory system; heated and air conditioned “climate control” front seats plus heated rear seats; dual illuminated vanity mirror; power windows with auto up/down and variable speed control for all windows; noise-dampening window glass on the front windshield; a powered rear window sun shade; Nu-Luxe interior door trim; an LED interior illumination system including map lamps; plenty of thoughtful in-cabin storage; analogue clock with LED illumination; a 12-volt accessory power outlet and retained accessory power; and more. Attention to detail defines the driving experience too, with driver-focused instrumentation and controls. A wallet-sized smart key is linked to the Lexus Smart Key System, and the LS comes alive with Push Button Start. Driver interface features include: electronic analogue gauges with thin film transistor multifunction display; the Lexus Remote Touch interface system; voice-activated hard disc navigation display; a 12.3” display system; tachometer; outside temperature gauge; auto-dimming rear view mirror; exterior mirrors that auto-tilt when the LS is in reverse, and linked to the driver’s seat memory system; a heated wood steering wheel on a power tilt/telescoping column linked to the driver’s seat memory system; a HomeLink Universal Transceiver; an anti-theft system with engine immobilizer and more. New for 2014, every LS now features, as standard, a 450-watt Mark Levinson Reference Surround Sound Audio system with 19 speakers in a 7.1-channel architecture. This remarkable system features in-dash DVD, USB and auxiliary input jacks, Bluetooth connectivity, integrated Sirius XM Satellite radio, and more. Also new for 2014, the audio system is enhanced with SIRI Eyes-Free, allowing easy voice-command access to SIRI-enabled functions on smartphones. All LS models feature a precision tuned and balanced 4.6L 8-cylinder engine. On LS 460 models, this engine is mated to an 8-speed Super ECT automatic transmission with sequential multi-mode shifter. In the LS 600h L, the engine is part of the Lexus Hybrid Drive system, mated to a dual-mode electronically controlled continuously variable transmission, high-torque electric motors, a powerful storage battery and sophisticated power management system. Lexus master craftsmen tune the power train to each, individual vehicle to maximize performance and efficiency – delivering a peak 360 HP in all-wheel drive models, 386 HP in the rear wheel drive model, and 438 net system horsepower in the hybrid models. Lexus handling and control systems – including a specially-tuned Vehicle Dynamics Integrated Management system – work in concert with steering, suspension and braking systems worthy of a prestige auto to ensure the LS driver may harness the full potential of the vehicle with confidence. Electric power steering is responsive and adjusts to vehicle speed to make cornering easy at low speeds even as it improves straight-line stability at high speeds. Front suspension systems feature anti-dive and anti-squat geometry, while front and rear suspension systems are enhanced with anti-vibration sub-frames and stabilizer bars. The LS 460L AWD and LS 600h L are further enhanced with front and rear air suspensions with the adaptive variable suspension system. Front and rear brakes are ventilated disc types, enhanced on the LS 600h L with an electronically controlled, hybrid regenerative braking system. All models feature a full complement of active and passive safety technologies. Standard safety systems include Intuitive Parking Assist and a back-up camera in the navigation display, plus eight airbags, seatbelt pre-tensioners and force limiters, a tire pressure monitoring system, on-board first aid kit, technologies such as vehicle stability control, traction control, antilock braking systems with brake assist and electronic brakeforce distribution, and more. This model features: Dual-zone automatic climate control, cruise control and a fuel efficiency of 10.8 L / 100 KM (city/highway combined). The LS 460 RWD may be enhanced with the F SPORT Package, which adds: Limited slip differential; 3-spoke F SPORT steering wheel with paddle shifters; sport tuned front and rear air suspensions enhanced with adaptive variable suspension systems; special summer tires on unique F SPORT wheels; Brembo high-performance brake systems with upgraded calipers, rotors and pads; additional safety technologies including the Blind Spot Monitor and Rear Cross Traffic Alert system; and enhanced styling, including a colour-matched full-skirt package, F SPORT front grille, premium leather F SPORT seats, aluminum dash accents and sport pedals with rubber inserts, an F SPORT shift knob and F SPORT scuff plates. The F SPORT Package adds: 3-spoke F SPORT, leather-wrapped steering wheel; sport tuned front and rear air suspensions enhanced with adaptive variable suspension systems; special summer tires on unique forged aluminum 10-spoke wheels; additional safety technologies – including the Blind Spot Monitor and Rear Cross Traffic Alert system; and enhanced styling – including a colour-matched full-skirt package, F SPORT front grille, aluminum dash accents, an F SPORT shift knob and F SPORT scuff plates. The Technology Package adds: dynamic radar cruise control; front and rear air suspensions enhanced with adaptive variable suspension systems; additional safety technologies – including the Blind Spot Monitor, Rear Cross Traffic Alert system, Lexus Pre-Collision System, clearance and back-up sensors and rear seat side airbags; enhanced comfort and convenience features – including four-zone independent automatic climate control, rear seat butterfly headrests, rear power seats with air conditioning plus vibration massage system, power rear door sun shades, a rear seat coolbox, and woodgrain interior trim. This long-wheelbase model adds the all-weather confidence of All Wheel Drive, with a fuel efficiency of 11.3 L / 100 KM (city/highway combined). It features additional rear seat legroom and comfort, plus many enhanced features as standard, including: Dynamic radar cruise control; front and rear air suspensions enhanced with adaptive variable suspension systems; Blind Spot Monitor, Rear Cross Traffic Alert system and Lexus Pre-Collision System; four-zone independent automatic climate control; rear seat butterfly headrests; rear power seats with air conditioning plus vibration massage system; power rear door sun shades; a rear seat coolbox; noise-dampening glass on side windows; and more. The LS 460L AWD may be enhanced with the Executive Package, which adds: LED headlamps; additional safety technologies – including Lane Keeping Assist, Lane Departure Alert, Full Auto Brake, Advanced Pre-Collision, Obstacle Detection, Nightview and Driver Monitor systems; and enhanced comfort, convenience and style features – including a retractable ottoman for the right rear seat with ottoman seat cushion airbag, Shiatsu vibration massage rear seats, premium leather seat surfaces, rear-seat Blu-Ray entertainment system with rear seat audio controls and a remote for audio and Blu-Ray functions, infrared body temperature sensors, leather-covered instrument panel and walnut wood trim. This long-wheelbase, all-wheel-drive, hybrid model delivers remarkable, advanced performance and efficiency – with a fuel efficiency rating of just 9.9 L / 100 KM (city/highway combined). Other standard features include: four-zone independent automatic climate control with infrared body temperature sensors and soft-touch heater controls; the Climate Concierge system with climate control front seats; 4-way power adjustable and air conditioned rear seats; premium leather seat surfaces; rear seat massage system; power rear door sun shades; ECO indicator; front and rear acoustic glass; Escaine roof head lining; wood and leather-wrapped steering wheel and shift knob; leather covered lower instrument panel and door armrests; heated wood steering wheel; automatic powered opening and closing trunk; milli-wave radar cruise control system; clearance and back-up sensors; LED rear seat reading lamps; additional safety technologies – including Lane Keeping Assist, Advanced Pre-Collision, Obstacle Detection, Blind Spot Monitor and Rear Cross Traffic Alert system; noise-reduction wheels; Lexus hybrid blue accent bading and trim; LED headlamps; and more. The LS 600h L may be ordered with the available Premium Executive Package. This adds additional safety technologies – including Nightview and Full Auto Brake. It also adds a rear-seat Blu-Ray entertainment system with rear seat audio controls and a remote for audio and Blu-Ray functions and a retractable ottoman for the right rear seat with ottoman seat cushion airbag, Shiatsu vibration massage rear seats, a rear seat armrest with built-in 12v power supply, and walnut wood trim. 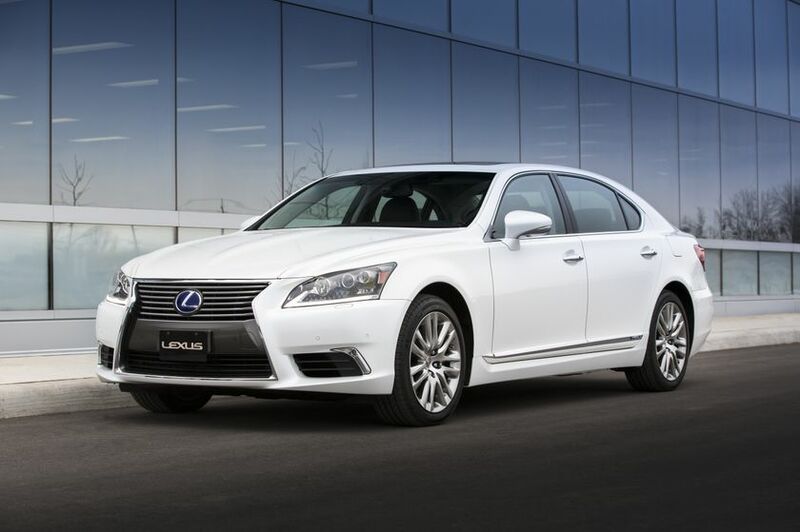 The 2014 Lexus LS 460 and LS 600h L are now on sale at Lexus Dealers across Canada. For more information on features and specifications, visit www.lexus.ca/ls.